179 people in our community are currently praying with you. ~ William Cowper, "O For a Closer Walk with God"
At about that same time, Abimelech and the captain of his troops, Phicol, spoke to Abraham: "No matter what you do, God is on your side. So swear to me that you won't do anything underhanded to me or any of my family. For as long as you live here, swear that you'll treat me and my land as well as I've treated you. "Abraham said, "I swear it." At the same time, Abraham confronted Abimelech over the matter of a well of water that Abimelech's servants had taken. Abimelech said, "I have no idea who did this; you never told me about it; this is the first I've heard of it." So the two of them made a covenant. Abraham took sheep and cattle and gave them to Abimelech. Abraham set aside seven sheep from his flock. Abimelech said, "What does this mean? These seven sheep you've set aside." Abraham said, "It means that when you accept these seven sheep, you take it as proof that I dug this well, that it's my well." That's how the place got named Beersheba (the Oath-Well), because the two of them swore a covenant oath there. After they had made the covenant at Beersheba, Abimelech and his commander, Phicol, left and went back to Philistine territory. Abraham planted a tamarisk tree in Beersheba and worshiped God there, praying to the Eternal God. Abraham lived in Philistine country for a long time. We learn today that Abimelech's tribe are called "Philistines", the first time we encounter them in Genesis. (This is actually the second time the word "Philistine" appears in the Bible. In Genesis 10:14, we learn that the Philistines are the descendants of a man named Casluhim, a great-grandson of Noah.) Abraham, unlike many Hebrew leaders to come after him, lives in peace with these Philistines. Beersheba is a spot whose significance is completely out of proportion to its size, for it was always a tiny town, struggling to survive at the northern edge of the Negev desert. Annual rainfall in the area is about eight inches, which would make it a true desert, incapable of sustaining a human population; however, due to a freak of geography, rainfall in the surrounding mountains collects and flows to an underground reservoir; this is the aquifer which Abraham taps with his well, and the reason a town can exist there. Still, the population was only 4,000 people as late as 1948 (when Palestine was partitioned). The oddest thing about all this is: What are Philistines doing in the middle of the Negev? It is far inland, starting just south of the Dead Sea. But most archeologists agree, based on the scarce evidence available to them, that the Philistines were a seafaring people, somehow associated with the Phoenicians, and part of a group that attacked Egypt by sea around 1200 B.C. Perhaps Abimelech's forebears had been defeated in a battle with Egypt and had fled, or been sent by a Pharaoh to occupy the area. We will probably never know. 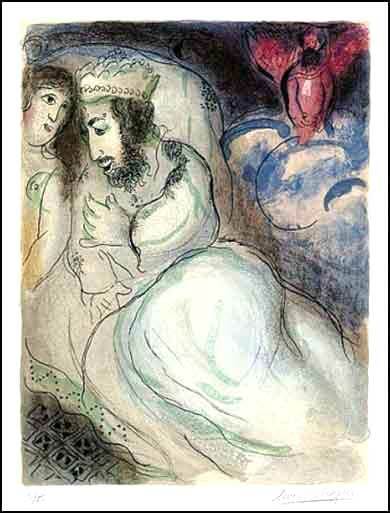 Abimelech and Sara, by Marc Chagall ca. 1960. Proverbs 15:1 : A gentle answer turns away wrath, but a harsh word stirs up anger.